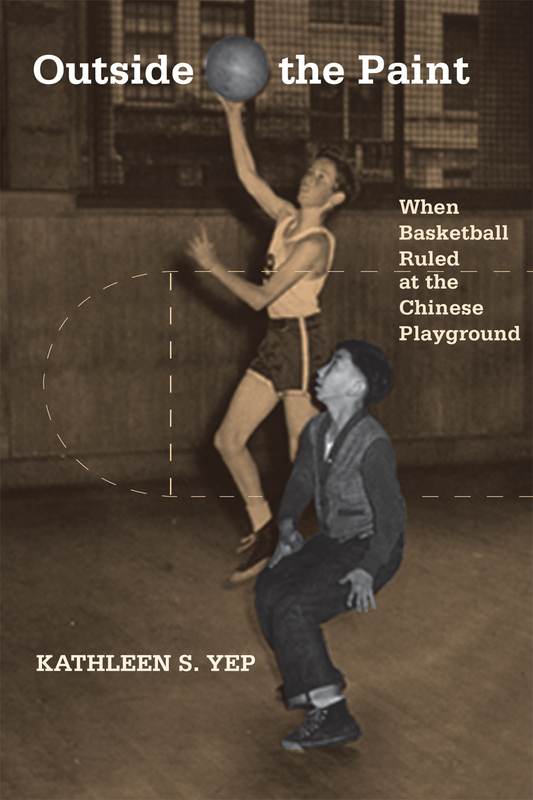 In this blog post, Kathleen Yep, author of Outside the Paint: When Basketball Ruled at the Chinese Playground puts Lin-sanity in context. As a former basketball player and as an Asian American, I am inspired by Jeremy Lin’s recent athletic showcase. On February 4th, the Taiwanese-American Jeremy Lin, exploded on the National Basketball Association’s (NBA) stage. He came off the bench to score 25 points and lead the New York Knicks to a comeback win over the Nets. The undrafted, twice-cut NBA player, Lin started the next eight games, scoring over twenty points a game including an astounding 38 points against Kobe Bryant and the Lakers. In the last weeks, Lin has captured the imagination of the United States and of basketball fans around the world. Thousands of newspaper articles, facebook posts, and blogs are reflecting/producing dominant narratives of sport, race, and masculinity through the phenomenon of “Linsanity.” On the heels of his meteoric stardom, the sports-industrial complex is poised to sell the transnational product of Jeremy Lin as evidenced by Adidas creating a jersey targeting the China market. The social construction of Linsanity resonates with the sports discourse about Chinese American basketball players in the first half of the twentieth century. Outside the Paint explores the politics of sport in relation to Chinese American female and male basketball players in the 1930s and 1940s in San Francisco. Discussing a playground, a professional men’s basketball team, the first Chinese American to play at Madison Square Garden, and championship women players, the book explores themes that echo today’s construction and consumption of Jeremy Lin. Seventy years prior to “Linsanity,” the first and only Chinese American men’s professional basketball team, the Hong Wah Kues, traveled around the country playing teams like the white Bearded Aces, the Harlem Globetrotters and a Native American team in the late 1930s. Similar to the media coverage of Lin, the spectacle in the 1930s was the unexpectedness of Chinese Americans as talented basketball players. Similar to today’s frenzy over Jeremy Lin, there were multiple currents of consumption in the late 1930s from not only the mostly non-Asian American spectators but also the Chinese American communities on the basketball tour. The invisible and marginalized Chinese Americans in the 1930s marveled at the visibility of players who looked like them. In 2012, Lin’s transcendence into a popular culture hero validates the vast network of Asian American players and basketball leagues that have thrived for over one hundred years. Similar to the debates about whether Lin is getting attention because he is a novelty, the 1930s Chinese Americans professional basketball players moved the usually black-white discourses around sport to the interplay of Chineseness, blackness, and whiteness. So, when I jump on the “Linsanity” bandwagon–I am going to buy a Lin jersey for my father’s birthday–it is challenging to separate the racial and gendered depictions of the 1930s Chinese American basketball players with today. And it is challenging to separate the pleasure of watching a great Chinese American basketball player burst onto the NBA scene from the problematic discourses that homogenize and celebrate all Asian Americans as the model-minority who do not confront poverty, underemployment, residential and linguistic segregation and challenges as immigrants. This is a crucial moment to shift the conversation: instead of debating whether or not race is involved with Linsanity, we explore how race in sport is constructed through the interplay of Asianness, blackness, and whiteness. How does the sports-industrial complex simultaneously circulate colorblind and hyperracialized rhetoric about African American, Chinese American, and white players? How are these circulations similar and different for the various racial groups yet part of a similar mechanism? Robert A. Brooks, author of Cheaper by the Hour, about temporary lawyers and the deprofessionalization of the law, has shared this blog entry about why he may have a law degree, he’s happier not practicing. I am a recovering lawyer. Now, that’s not as bad as it sounds. I’m happy I went to law school and got some good experience practicing at a couple of corporate firms and the U.S. Justice Department, and I still use my legal skills (in my personal life and as a Criminal Justice professor). But I’m happier that I stopped practicing. I can’t help but notice that the law (as well as other professions) seems to be headed toward greater proletarianization (bureaucratization and other processes that leave attorneys little ideological control over their work) and deprofessionalization (work is becoming more standardized, routinized, insecure, and surveilled). I wrote about these processes in my book Cheaper by the Hour which is based in participant-observation (I did the work myself for three years while working on my dissertation) and in interviews of other temporary lawyers. 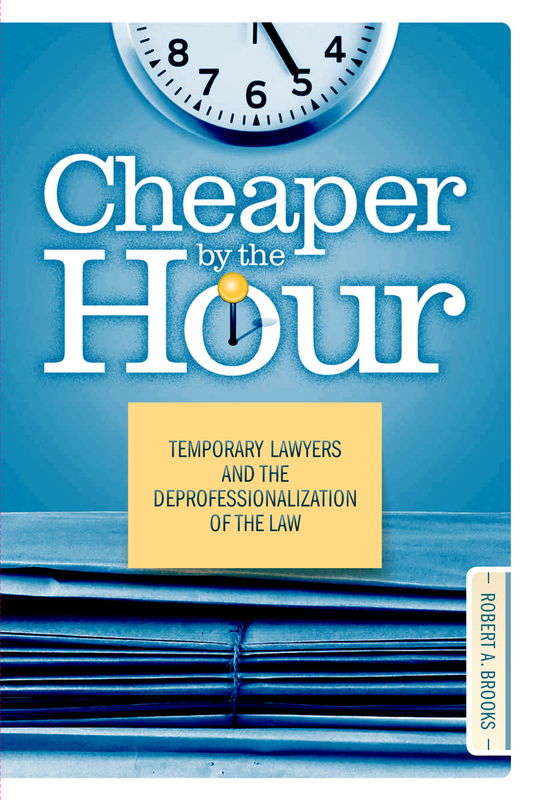 Cheaper by the Hour calls temporary lawyers the “leading edge of the new legal underclass” and describes attorneys working in sometimes abysmal physical conditions and performing rote work (“document review”) that uses few legal skills. In a review of the book, Library Journal rightly called this a “Dickens-meets-Dilbert world” (nice – I wish I’d thought of that myself). Lawyers’ dissatisfaction with the law and their careers is of course nothing new, but there seems to be a harder edge to it now, a deeper disappointment. Witness the recent slew of lawsuits (described in the New York Daily News) filed by alumni of a dozen law schools that claim the schools inflated their placement statistics. I’d love to hear from current law students, recent grads, practicing lawyers, and burnt-out ex-lawyers. Is the practice of law changing fundamentally? Do you find satisfaction with your work? Are you able to balance work/life demands? Are you under-employed and overburdened with debt? Would you do it all over again if given the chance? The youth vote in 2012? 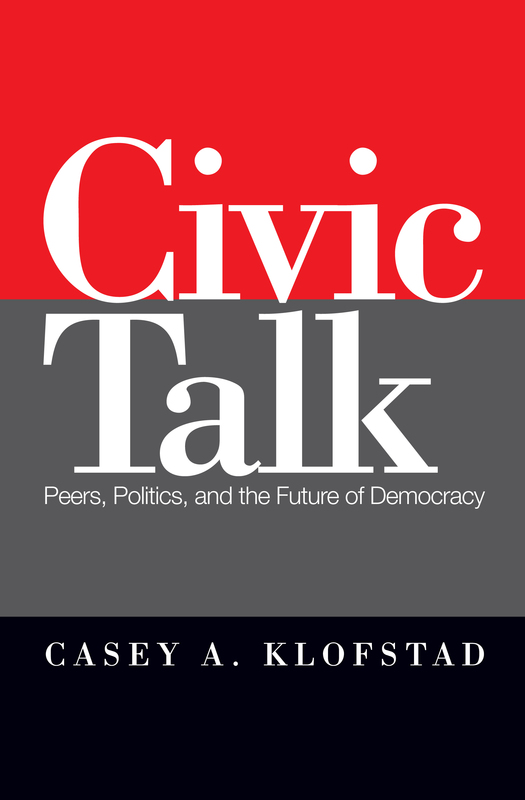 In this blog entry, Casey Klofstad, author of Civic Talk, questions how–and if–young American voters will participate in the 2012 elections. With the 2012 presidential election in full swing, many are asking whether younger Americans will turn out to vote. What I have learned from interviewing college students over the past decade suggests that most will not. Don’t get me wrong, college students are very civically engaged these days. For example, when I asked college freshman how important it is for them to be active and interested in politics and current events, 91% said that it was somewhat or very important. However, when I asked them whether political participation is an effective way to solve important problems facing the country, over 70% said that they would rather try to address those issues by volunteering in their community. What explains this disconnect between civic-mindedness and political apathy among America’s youth? My research suggests three culprits. First, voting, like most other behaviors, is habitual. Since the voting age is 18, younger citizens have not had enough time to acquire the habit. Second, due to policies enacted by the federal government during the early 1990s, American high schools have service learning requirements. However, to avoid any impression of ideological bias, these programs teach community voluntarism rather than political activism. Third, while service learning requirements offer high school students pre-packaged ways to become civically active, universities and colleges are less likely to make such demands of their students. My research shows that this leads to significant declines in community voluntarism and political participation between the senior year of high school and the first year of college (these declines are slowly made up over the subsequent years of college). This schism between political and community engagement among America’s youth is a serious problem. We should, of course, celebrate the fact that Americans in their late teens and early twenties are engaged in their communities (e.g. volunteering at a homeless shelter is a noble service). However, it is equally important for them to learn that democracy demands that they also be active in the process of self-governance (e.g. myriad governmental policies have an influence on homelessness). The upcoming election will be hotly contested, and the outcome is likely to be very close. Nonetheless, while younger Americans are affected by countless government policies, from financial aid to the long-term solvency of Social Security, most of them will not be making it to the polls in November. It is the job of educators, like me, to work to reverse this trend.